The ADDERView Secure range of products are highly robust KVM switches for critical applications. When information absolutely must not be leaked between systems or networks, the ADDERView Secure units combine the necessary isolation with a desirable ease of use. 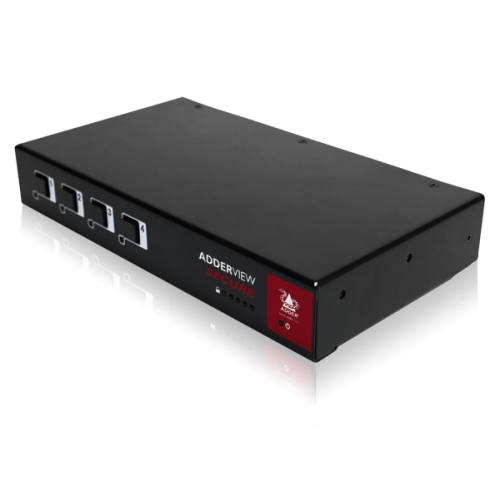 ADDERView Secure units combine a number of overlapping strategies that are designed to defeat potential points of infiltration or protect against user error. Tempest certified design (USA NSTISSAM Level I and NATO SDIP-27 Level A). Data Diodes, implemented within hard-wired electronic circuitry, rather than software, are liberally employed to ensure that critical data paths can flow only in one direction. These data diodes ensure that a compromised peripheral, a keyboard for instance, cannot read information back from a connected system in order to transfer such details to another system. Whenever a channel is changed, the connected keyboard and mouse are always powered down and re-initialized to provide yet another level of protection against hidden peripheral malware. In general, the role of software within the unit has been reduced to an absolute minimum to avoid the possibility of subversive reprogramming. Additionally, all flash memory has been banished from all security critical areas of the design, to be replaced by one-time programmable storage which cannot be altered. The outer casing contains extensive shielding to considerably reduce electromagnetic emissions. Additionally, the casing has been designed with as few apertures as possible to reduce the possibility of external probing and several primary chassis screws are concealed by tamper-evident seals to indicate any unauthorized internal access. Shielding extends also to the internal circuitry with strong levels of electrical crosstalk isolation between ports to protect against signals from one computer becoming detectable on another. ADDERView Secure units are available in two port and four port sizes. Each size can be ordered in standard and enhanced versions. 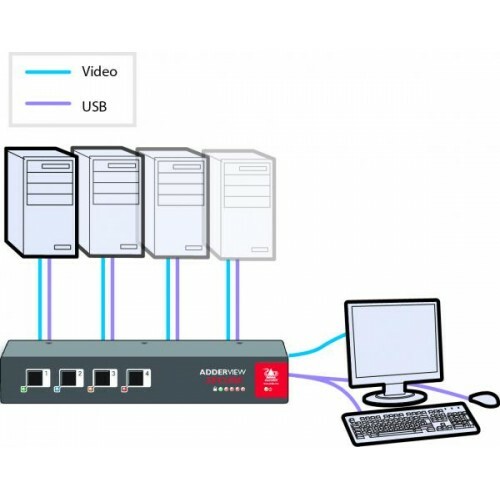 The enhanced versions allow you to attach a smart card reader that can be securely shared between the connected systems. The enhanced versions also contain anti-subversion and authentication features that guard against intrusion and allow you to prove that the unit is genuine, respectively. These are just a few of the many strategies and innovations that have been combined to reinforce the separation between differing systems. Numerous other defences lie in wait to defeat potential threats.